Larry Chilly speaks out against mankind's global irresponsibility. Joe Centigrade, president of the Advocates For Beings Of Frozen Precipitation, spoke at a mass rally Tuesday on Washington's National Mall. "The unseasonably warm winters of the recent past are a clear indication of a real environmental threat to humans and their frozen simulacra," said Centigrade, his coals arranged in a frowning pattern. "As snowmen and snowwomen, we accept the inevitability of melting, but the actions of man are causing us to evaporate well before our time." Speakers at the Washington rally included a Chicago snowwoman who had lost three snowchildren to warm temperatures, the Rev. 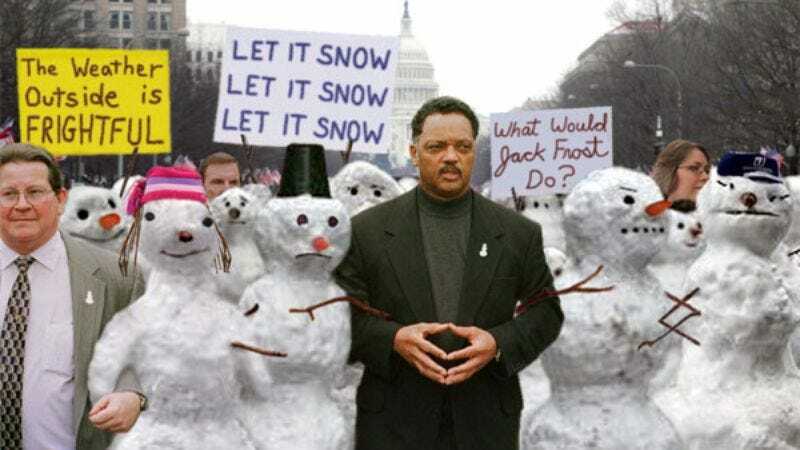 Jesse Jackson, and Larry Chilly, formerly a 6-foot-tall, triple-segmented Muncie, IN snowman, who had been reduced to a slushy head. Centigrade told the slowly melting snowcrowd that as recently as 15 years ago, the average life span of a snowperson built in late December was three weeks to a month. Today, that same snowperson has an average life span of two weeks. Centigrade also recounted stories of once-jolly snowmen unable to keep their carrot noses in their fast-melting faces, and of others who were made of only two undersize segments. "In many regions of New England today, there's not even enough snow on the ground to make snowballs, much less a torso," Centigrade said. "Instead, some snowmen are stuck together with slush and leaves rather than pure, white snow. We must take steps now to end their suffering." Bearing signs with such slogans as "You Can't Build A Snowman With Rain" and "Winter = Life," the crystalline-ice protestors, many of whom had chartered refrigerated tractor-trailers and ice-cream trucks to travel to the mass protest, complained that popular stereotypes about snowmen obscure and trivialize the crisis. "Humans sneer at us, 'If you want to stay intact, go to the North Pole and live with Santa,'" said Susie Flakeman, a Thunder Bay, Ontario snowwoman waiting in line with hundreds of others to use a Porta-Freezer. "But less than one-half of 1 percent of us ever receive that honor. Most of us end up victims of the scourge that almost killed Frosty: man-made climate change." The protest was largely peaceful, disrupted only by a disturbing incident in which one distraught snowman hurled himself into the reflecting pool of the National Mall. He suffered third-degree slush on over 90 percent of his body before rescuers could recover him. He was rushed to a local meat locker where he was pronounced melted on arrival. Some scientists refuted the snowbeings' claims regarding global warming. "Throughout history, the earth has endured periods of temperature fluctuation," said Dr. Harley Morrison, a biochemist who has advised President Bush on scientific issues. "Also, there have already been several major blizzards throughout North America this season alone. I made a snowman myself, and he lasted for several weeks." Late word arrived Tuesday evening that the Moscow protest was violently dispersed by riot police bearing hot-water hoses and snow blowers. Moscow officials said the snowmen were illegally blocking pedestrian traffic near the Kremlin and causing people to slip and fall in their slushy wakes. Snow leaders, including Centigrade, condemned the crackdown. "Those of us who remember the Icelandic anti-heated-sidewalk riots of the 1980s know that the powers that be despise and fear snowmen who fight for their rights," Centigrade said. "They'd rather kill the messengers than face the fact that our ecosystems are changing irreparably. We're prepared to stay in D.C. as long as it takes until Congress agrees to listen to our demands." Before he could conclude his remarks, Centigrade's face slid off.